Friday (16/3), Student Manager of FMIPA UI, Dr. Tito Latif Indra as the Chairman of the Committee, announced the winner of Electoral Student Selection of Faculty of Mathematics and Natural Sciences UIP 2018 in Building C FMIPA UI at the award winner of Faculty of Mathematics and Natural Sciences of Faculty of Mathematics and Natural Sciences of 2018. The first winner is Dhita Mutiara Nabella (Biology 2015), followed by Maria Maghdalena ( Chemistry 2015) as the second winner and Hanna Tiara Andarlia (Mathematics 2015) as the third winner. Representing the Dean of FMIPA UI who was unable to attend, Tito expressed his appreciation to the participants, as well as the jury team, the department chairman, the head of the study program and the well-educated faculty who held the most prestigious event among the faculty level students so that the series of events can run smoothly. In addition Tito also motivates the other students to continue to improve academic achievement. “Others do not get discouraged, winning the usual defeat is important to keep trying the best, continue to work, be creative,” said Tito. According to him, UI’s Faculty of Mathematics and Natural Sciences has a lot of potential in the academic field, but few are interested to participate in this competition, so he hopes that through this activity more and more students of FMIPA UI are active in involving themselves to participate in academic competition. Dhita Mutiara Nabella was chosen as the first winner through his paper entitled “The Rehabilitation and Conservation Effort of Peat Land through Sustainable Sago Plantation Development (metroxylon sago Rottb) in Indonesia”. In this Pilmpares competition Dhita is a “Single Fighter” representing the department of biology. Previously the biology department sent two of its best students as its representative, Dhita Mutiara Nabella and Aldi Yazri Siregar, but Aldi decided to resign from this competition for several reasons. Student Selection Achievement FMIPA UI 2018 was followed by nine finalists who are undergraduate students (S1) from all departments in FMIPA UI. 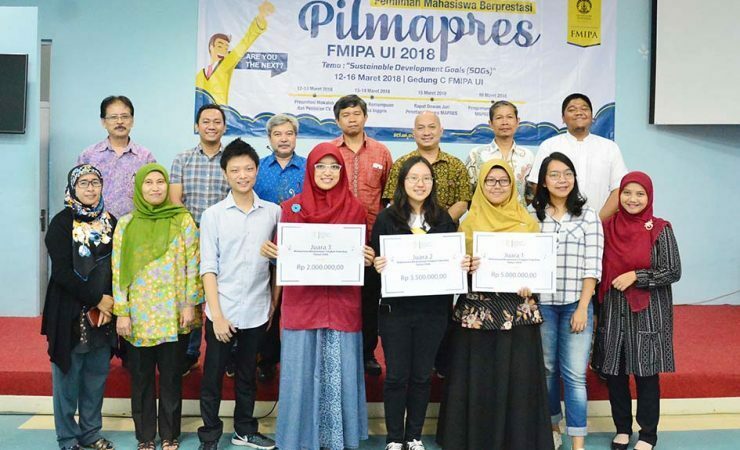 The nine finalists of Mapres FMIPA UI 2018 are Grady Christianto & Hanna Tiara Andarlia representing Mathematics Department, Ade ratna Tanjung P. & M. Risky Altaresh representing Department of Physics, Shella Jeniferiani W. And Maria Magdalena representing Department of Chemistry, Dhita Mutiara Nabella representing Department of Biology, Yuniar Zweistika and Annisa Daniswara S. represent the Department of Geography. The competition circle of Faculty of Mathematics and Natural Sciences UI 2018 started on Monday (12/3) at Building C FMIPA UI, Depok and opened by Dr. rer. grout. Abdul Haris as Dean of FMIPA UI. At the beginning of the series, the participants presented their own papers in front of the jury. Then on Tuesday (13/3) they presented and discussed one of the many topics randomly determined by the jury. The topics are focused on the theme of this year’s pilmapres, “Sustainable Development Goals (SDGs)”. All academic civitas congratulate Dhita, as well as raising the hope that the next Dhita will compete at the University of Indonesia, can defend the title of UI Achievement Main Student Achieved last year by Yudhistira Oktaviandie who is also a biology department student of FMIPA UI.